The country star has fun in her new clip. 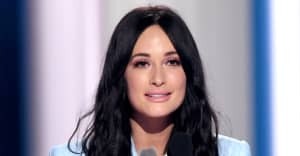 Kacey Musgraves released the video for "Biscuits" today. Her latest single is as easy-going as they come, full of live-and-let-live, mind-your-own-business, it’s-all-good platitudes. "Just hoe your own row and raise your own babies," she sings. "Smoke your own smoke and grow your own daisies / Mend your own fences and own your own crazy / Mind your own biscuits and life will be gravy." She must have enjoyed filming the goofy clip, which allowed her to dress up as both a butter-churning pioneer and a mustachioed chicken-farmer. Musgraves' highly-anticipated second album, Pageant Material, is due 6/23. Check out FADER’s cover story on the singer.